Catalyst 2960 routing | CCIE or Null! Routing on a Cisco 2960 Catalyst Switch! Yep, you read that correctly. You can now route on the low-end layer 2 Catalyst 2960 switches (Sounds like one bad oxymoron right?). This feature was introduced in IOS 12.2(55) and requires LAN Base which has been around since late last year, however it is not a very known feature which shocks me! I figured the addition of routing (Albeit limited routing functionality) on a 2960 switch would have been some great news! Now don’t go expecting to run OSPF or EIGRP on a 2960, in fact it does not support any routing protocol, so your natural reaction is going to be then what is the point? Well it supports inter-vlan routing and up 16 static routes. Remember one of those static routes can be a default route up to a distribution switches’ HSRP address (or VSS Core) allowing you to implement a routed access layer for cheap! Now in regards to the configuration, once you have 12.2(55) or newer loaded on your 2960 you will need to make sure the switch is running the proper SDM (No, not Security Device Manager for those that are unfortunate to remember it) Switching Database Manager. If you are not familiar with the SDM templates on Catalyst switches they are definitely worth a look at it, especially since the SDM template instructs the switch how to curve up resources to the TCAM. (IE: Mac tables, routing tables, unicast/multicast, QoS, etc -Obviously not all of those pertain to the 2960). The Catalyst 2960 now has the option for ‘lanbase-routing’, which is the SDM we need to enable. Show sdm prefer – to see the active SDM template in use. Note: When we change the SDM the switch requires a reboot for the new SDM template to take effect because it changes the resources allocated by the TCAM. If you change the SDM and do not perform a reload your changes will not take effect and if you issue sh sdm prefer again the switch will tell you which SDM the switch will load upon next reload. 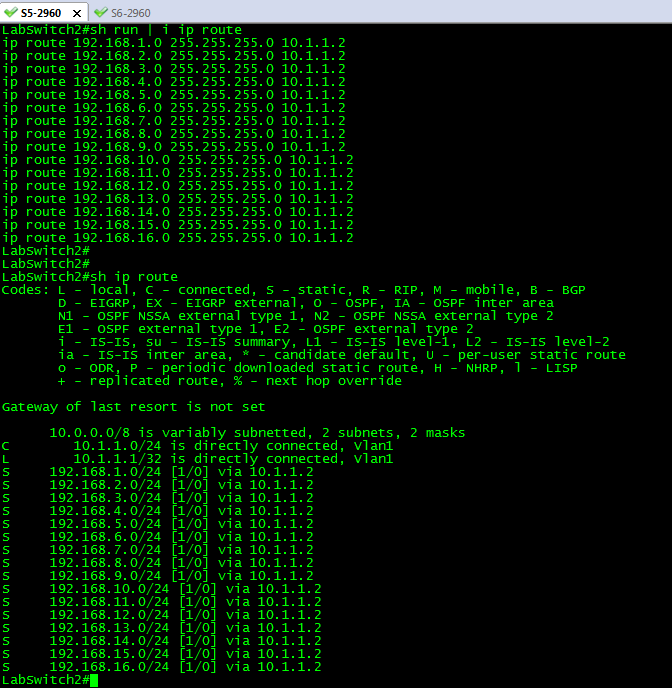 Now, that ‘ip routing’ is enabled we can go ahead and view the routing table of the Catalyst 2960! Check it out!! A routing table on a Catalyst 2960! I placed 22 routes into configuration mode and after #16 the switch silently discarded the rest of the routes. Something else I found pretty interesting is the fact my other VLAN interface disappeared from the routing table (172.16.1.0 /24 which is in the previous screen capture, which is a connected route!) So this feature really is limited but it is there none the less. In this post I was running 12.2(58) on one of the 2960 switches in my lab C2960TT-L I believe, I was able to place a client one vlan and ping across to another two VLAN attached to the 2960 with no other routing device in the path. NOTE: WordPress is distorting my images so until I figure out why, all the screen shots in this post are meduim/thumbnail size and can be viewed in full size when clicked on.